Should Your Family Caregiver Have To Join A Union? Many families face the challenge of having to take care of elderly parents or disabled children. In certain states these family members are classified as public employees and required to have union dues taken out of the Medicaid funds that help pay for this care. If we are not careful, mom is going to be classified as a public employee so that unions can collect dues from her! House Republican Conference Chairwoman Cathy McMorris Rodgers (R-Wash.) will introduce a bill by the end of February “that would prohibit states from allowing unions to automatically deduct dues and fees from Medicaid funds that are intended to help family caregivers,” according to McMorris Rodgers’ aides. A civil monetary penalty will be handed out for any violations of the proposed bill, according to the chairwoman’s office. “Due-skimming is robbing our nation’s most vulnerable who need Medicaid the most,” an aide told IJR. Caregivers took to Capitol Hill on Tuesday, calling on Congress to stop states — including California, Minnesota and Illinois — from classifying family caregivers as public employees. House GOP officials say ending the practice could save Medicaid and other programs as much as $200 million a year. “What bothers me the most is, I know a lot of parents, because I’m in this community,” said Miranda Thorpe, a registered nurse who also cares for her 21-year-old daughter, according to Fox News. “And none of them really understand that this is happening to them. They have no idea. I don’t think the state should be the factor that colludes with unions to take out this money without people’s knowledge,” Thorpe added. I don’t have a problem with unions, but they have become as corrupt as politicians (and sometimes the two work together very closely). Union dues should be collected from people who choose to join a union. Union fat cats live as well as the corporate fat cats they condemn (at least the corporate fat cats generally produce either a product or a service). It is time for the practice of penalizing family members who provide care for a family member to end. Yesterday Fox News posted a story about Kentucky‘s plan to follow President Trump’s suggestion to add a work requirement for receiving Medicaid. Under the new rule, adults age 19 to 64 must complete 80 hours of “community engagement” per month to keep their care. That includes working a job, going to school, taking a job-training course or volunteering. One of the comments under this article on the site where I saw it posted commented that benefits were not for the benefit of the recipients, but to make sure how the recipients voted. Unfortunately we have created a group of people in America who would rather receive free things that the rest of us pay for than earn those things himself. I realize that some people need these benefits and have valid reasons for wanting them, and we need to help these people. However, we need to end the free ride for those who are taking advantage of the situation. Note that the requirement is 80 hours a month. That is not a lot. That is approximately 20 hours a week. That is not an unreasonable requirement. Yesterday The Heritage Foundation posted their evaluation of the bill to replace ObamaCare. Admittedly, The Heritage Foundation is a politically conservative group, so their solution to ObamaCare would be aimed at shrinking government, not just moving the chairs around. The article goes on to explain that the people who need relief from ObamaCare are the people whose premiums and deductibles rose dramatically. That is the group the does not get relief in the new bill. The new bill leaves costly regulations in place and attempts to offset those costs with subsidies. That is what most Americans want to get rid of. That is exactly backwards from what is needed. The new healthcare bill also fails to reign in Medicaid. Please follow the link above to read the entire article. There are three things that need to happen with health insurance in America–the policy needs to be attached to the person–not their employer, policies need to be portable across state lines, and people with pre-existing conditions need to have a way to be insurance. Other than that, the government needs to get out of the healthcare business and let the free market rule. It will be bumpy for a short while, but if we don’t do it now, things will only get worse. Yesterday Investor’s Business Daily posted an editorial about the repeal of ObamaCare. The editorial made some very important points. First of all, the writer reminded us that the demonstrations opposing the repeal of ObamaCare were planned by the Democrats shortly after the election. There are some people who want to keep ObamaCare, but despite what you see on the news, they are a minority. Imagine that Democrats announced a health care reform plan that would force millions to cancel health plans and leave the doctors they like, drastically reduce choice and competition in the individual market, cause health insurance premiums to skyrocket, blow billions of taxpayer dollars creating faulty “exchanges” and failing co-ops, leave millions of middle-class families stuck with higher deductibles and higher premiums, cause massive industry losses, slow the economy, cost jobs, and increase the deficit. Those are the results ObamaCare’s critics predicted and, without exaggeration, what it has produced. Does anyone honestly believe ObamaCare would have ever made it to Obama’s desk if its backers had been honest with the public? ObamaCare will implode on its own in a year or so, but the chaos it will leave will take years to undo. 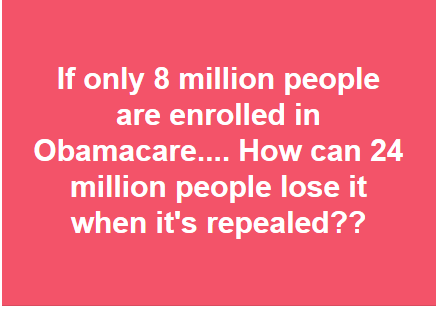 It makes much more sense to repeal it before it collapses. During the Obama Administration, Congress took numerous votes to repeal ObamaCare. It was a safe vote–Congressmen knew that President Obama would veto anything that actually got through the Senate, and nothing would happen. Now that a vote to repeal ObamaCare would actually mean something, Congress is stalling. I have not given up on the repeal of ObamaCare. However, I have pretty much given up on the Republican party. If they choose not to repeal ObamaCare, how are they any different from the Democrats? How can their platform say that they support smaller government and their actions say something else? In plain English, it is time for the Republicans in Congress to put up or shut up. Yesterday The New York Post posted an article about the financial condition of Medicare. It seems that Medicare is really doing rather well. 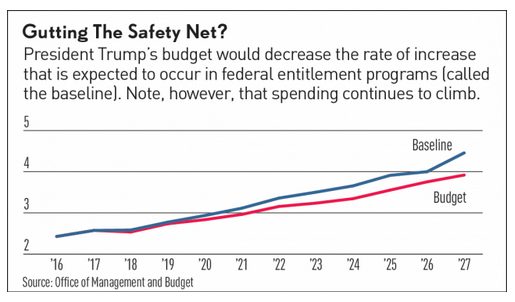 As the new Congress convenes, budget cutters are eyeing Medicare, citing forecasts the program for seniors is running out of money. But federal bean counters have erroneously predicted Medicare’s bankruptcy for decades. One reason: They don’t consider medical breakthroughs. Another problem is medical ethicists like Dr. Ezekiel Emanuel, who insist the elderly are a burden and that resources would be better spent on the young. The facts prove otherwise. New medical findings give plenty of reason for optimism about the cost of caring for the elderly. According to data published in the journal JAMA Internal Medicine, Medicare spending on end-of-life care is dropping rapidly, down from 19 percent to 13 percent of the Medicare budget since 2000. Living to a ripe old age shouldn’t be treated like it’s a problem. It’s a bargain. Someone who lives to 97 consumes only about half as much end-of-life care as someone who dies at 68. Keep in mind that Dr. Emanuel was one of the people behind ObamaCare who espoused the idea of limiting medical care for older Americans. That is one of the reasons it was so surprising that the AARP supported Medicare. They betrayed their own members. Medicaid spending now tops $8,000 per recipient. That’s thousands more than is spent on people in private plans. And for all that money, studies show Medicaid isn’t improving patients’ health. By contrast, Medicare is a success story. It has transformed aging, enabling older Americans to lead longer, more independent lives than our grandparents did. The average man turning 65 today will live five years longer than in 1970. Not just more years. Quality years. What a gift. Medicare is partially paid for by payroll deductions from both the employee and the employer totaling about 2.9 percent, so Medicare is at least partially paid for. Medicaid is a gaping hole in our pockets that does not guarantee quality care to anyone. Healthcare in America is a problem that ObamaCare has made worse. Hopefully Congress and President Trump can come up with something that provides care for everyone who needs it, but also allows free market competition to keep the costs down for everyone. Today’s Wall Street Journal included an article about the current state of ObamaCare. The article mentioned that Health and Human Services Secretary Sylvia Burwell recently announced that by the end of next year she expects 10 million people to be enrolled in ObamaCare. She failed to mention that in March 2014 the Congressional Budget Office predicted that 21 million people would be enrolled in 2016. The Obama Administration explains the difference as the result of fewer companies dropping employee heath insurance than expected. There are some facts left out of the statistics quoted by ObamaCare supporters. Supporters claim that ObamaCare helped 9 million Americans get health insurance coverage in 2014. 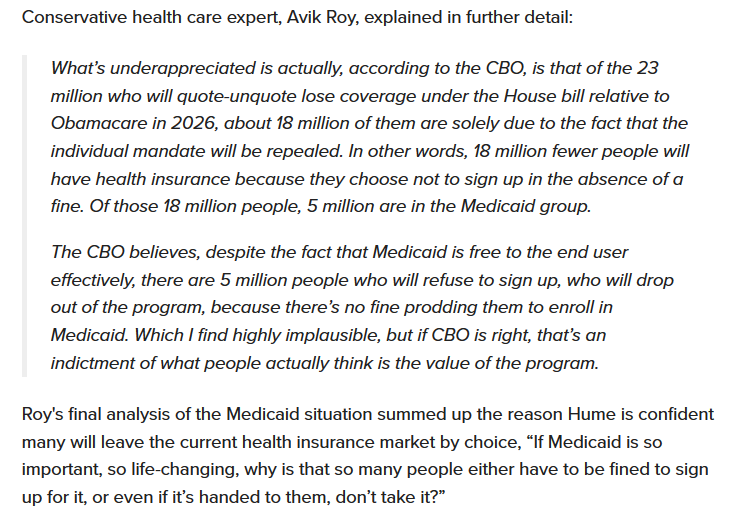 The Heritage Foundation showed that nearly 9 million people were added to Medicaid. The 9 million were given free or nearly free health insurance. That’s really not much of a sales accomplishment. The article is written by Andy Puzder, Chief Executive Officer of CKE Restaurants. He observes that of his company’s 5,453 employees who were not eligible for company health insurance, only 420 enrolled in ObamaCare. The problem with ObamaCare is that it expects healthy young people to pay higher premiums to cover the cost of the older, less healthy, insured. Young people are not inclined to do that and are instead paying the penalty for not being insured. The problem with that is that the penalties are paid to the government and not to the insurance companies and do nothing to help with the imbalance on what is paid in and what is paid out. Insurance companies charge premiums based on actuary tables, and ObamaCare has chosen to ignore the basis of the business model of insurance companies. In essence, they have attempted to reinvent the wheel while leaving out the spokes and the hub. The private sector always does better than the government when it comes to business models. Hopefully, we will elect a President next year who will rid us of this horrendous program. CBS Local in New York is reporting today that the New York State Health Exchange gave out $325,000 in overpayments to the deceased throughout the 2013 fiscal year. Auditors said flaws in the eligibility process also resulted in New York enrolling 21 dead people for Medicaid, while continuing government-funded health coverage for 333 others who died. The state comptroller’s office says its auditors found overpayments of $3.4 million in total for the year starting Oct. 1, 2013. The Health Department says it’s been awaiting a new federal system to verify deaths. It confirmed 321 people cited in the audit were dead, four are still alive and it’s checking the other 29. This might be one way to cut the cost of Medicaid–make sure the people claiming to be covered under it are alive. The NY State Health Exchange launched in Oct. 2013, but many faced confusion and other issues like lost insurance coverage and high premiums though the initial enrollment process. The exchange was established under the Affordable Care Act in an effort to extend coverage to uninsured New Yorkers. Medicaid now covers about 6 million New Yorkers and costs $60 million annually. The department notes state enforcement efforts in 2011-2012 recovered $1.73 billion. It’s time to get the government out of healthcare! On Friday, The Daily Signal posted an article about the payments that were supposed to bail out insurance companies for their losses under ObamaCare. When the health insurance companies initially balked at the provisions of ObamaCare, President Obama sweetened the pot by demanding that everyone have insurance, providing subsidies to make insurance affordable and expanding Medicaid. The law also created two back-end bailout programs designed specifically to benefit insurers selling Obamacare plans in the individual market. Goody No. 1 was a reinsurance program that reimburses Obamacare plans for most of the expenses run up by people with high annual claims. Funded by a tax on everyone with non-Obamacare coverage, the reinsurance program shoveled nearly $8 billion to Obamacare insurers last year. The design amounted to a double bailout, with taxpayers on the hook for subsidizing insurance company losses on the back end as well as for the front-end subsidies and mandates that benefited insurers. Jeff Sessions, R-Ala, led the effort to block the subsidies to insurance companies. Congress decided that the taxpayers should not be responsible for bailing out the insurance companies, and the taxpayers saved $2.5 billion this year. The Republican Congress can say that it accomplished at least one thing this year. The Wall Street Journal posted an article yesterday about the amount of tax revenue the federal government collected for fiscal 2015. The good news is that the government collected a record amount of money–$3.249 trillion. That is an 8 percent increase in revenues for the year. The bad news is that the government still managed to spend more than it took in. The budget deficit was $435 billion–a decline of $48 billion. The article notes that although the decline is small, it is huge for the seventh year of what the government claims is an expansion. The article also notes that inflation is growing by less than 2 percent. The reason for the small decline is that spending for the fiscal year climbed 5.2% to $3.685 trillion. That increase came even though defense spending fell $16 billion, or 2.7%, thanks to the drawdown in Afghanistan. The spending burst included a 16.1%, or $49 billion, increase in Medicaid for the first full year of ObamaCare. Medicaid spending has climbed $85 billion to $350 billion in two years, and that’s with 19 states declining to join. The Congressional Budget Office also cites a $30 billion, or 51%, spending increase for the Department of Education—“mostly because of an $18 billion upward revision in the estimated net subsidy costs of student loans and loan guarantees issued in past years.” Translation: Mr. Obama’s takeover of the student-loan business is costing far more money than advertised, probably due to growing defaults. Let’s put these numbers together. Inflation is less than 2 percent. There was an 8 percent increase in revenues collected by the federal government. There was a $435 billion deficit. These numbers are unsustainable. They will assure the destruction of America. We need to elect people to Congress and the White House who will cut government spending. 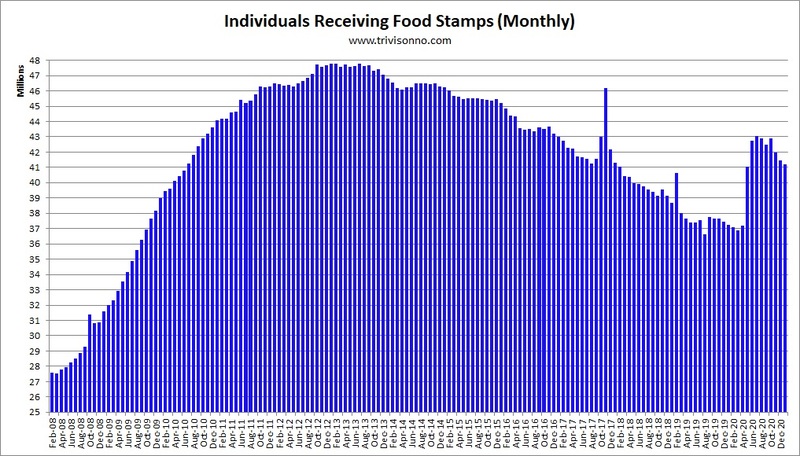 It is a national disgrace to have an 8 percent increase in revenues and still have a deficit. It is time for any rational members of Congress to demand a spending cut. America is a country that was built by immigrants. People came here from Europe and other places to celebrate freedom, escape religious persecution, or simply to begin again. The Catholics fled the potato famine, the Jews fled the pogroms, and others came to buy land to farm and support a family. Well, not all of today’s immigrants have the same sort of ambition. National Review reported today that 42 percent of new Medicaid recipients are immigrants. Federal law bans the admission of immigrants who are likely to be significant beneficiaries of welfare, technically a “public charge,” but that definition doesn’t consider in-kind welfare programs like Medicaid: U.S. Citizenship and Immigration Services defines being a public charge as “the receipt of public cash assistance for income maintenance or institutionalization for long-term care at government expense.” The USCIS union president has recently complained that President Obama is not enforcing public-charge laws. Illegal immigrants are ineligible for Medicaid currently and are technically ineligible for the Medicaid expansion or any other direct Obamacare benefits, but fraud in the program is rarely investigated and recipient-level eligiblity is rarely investigated. The article also reminds us that Medicaid has been expanded so that people with incomes up to 138 percent of the federal poverty line are eligible. This greatly increased the cost of the program. I am not opposed to immigration, but I question the wisdom of an immigration policy that allows people to come here and be a burden on the federal government. Our federal deficit is out of control, why are we passing laws that make it worse?